Based on literary references and the discovery in the 18th century of marble busts of imperial figures, the site is believed to have been the property of the Antonine Dynasty (138–193), which begun with the reign of Antoninus Pius and included emperors Marcus Aurelius, Lucius Verus and Commodus. “We first noticed a small section of a curving structure next to the baths. 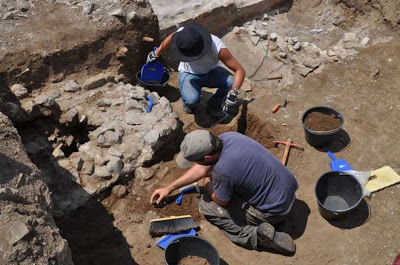 Ground-penetrating radar mapped out the entire foundations revealing new specular curving structures,” Deborah Chatr Aryamontri, a co-director of the excavation, told the Italian daily Il Messaggero. Forming an ellipse, the arena could sit more than 1,300 people. It featured an imperial box and was richly decorated with mosaic tesserae and luxurious, imported marbles. “The very numerous pieces and fragments of marble of varied thickness and dimensions include white marbles as well as colored ones such as serpentine, porphyry, giallo antico, pavonazetto, cipollino and africano — basically the most common decorative types imported from North Africa and the Aegean region,” Chatr Aryamontri, and co-director Timothy Renner, wrote. “The tesserae, or cubic tiles used for mosaics, include many from black and white compositions (leucitite and white limestone), while the remainder are small colored glass tesserae that represent a large part of the color spectrum and include transparent examples covered with gold leaf,” they added. According to the archaeologists, several large blocks of worked peperino stone would have helped support an awning system (velarium) to shade spectators from the sun, just like at the Colosseum in Rome. Most likely, it was in this opulent setting that Commodus practiced for his first semi-public appearances as a killer of animals and a gladiator. Succeeding his father, Marcus Aurelius, Commodus ruled Rome from 180 A.D until 192 A.D., when he was strangled in his bath by a wrestler. Immediately after he became emperor, he displayed his strength in gladiatorial combats at Rome’s Colosseum. An accomplished left-handed fighter, determined to cast himself as “Hercules reborn,” Commodus was also a skilled hunter, showing his ability in the Colosseum by killing bears, tigers, hippopotamuses, elephants, but also domestic animals. He delighted the public by shooting crescent-headed arrows at ostriches, who continued to dash around even after they had been decapitated. In the Oscar-winning film “Gladiator,” Commodus, played by Joaquin Phoenix, fought to the death in the Colosseum in Rome with fictional army general Russell Crowe. At the private mini-Colosseum in Genzano, Commodus might have enjoyed more elaborate shows. Indeed, an underground canal around the amphitheater suggests that naval battles were staged there. Leading down to underground chambers, a spiral staircase brings to mind the arrangements at the Colosseum in Rome. Most likely, lifts were used in the Genzano Colosseum to raise scenery and possibly animals.